What do acne and eyesight have in common? They both benefit greatly from Vitamin A. And this vitamin doesn’t stop there. What we know as Vitamin A is actually a group of antioxidant compounds that support not only vision, but bone growth, our immune system and skin health as well. What exactly does it do? It helps our skin and mucous membranes form effective barriers to bacteria and viruses, it reduces the risk of eye infections, it boosts our immune system against respiratory problems and other infectious diseases. 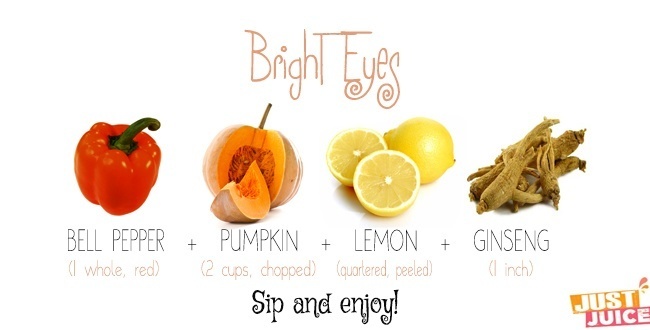 It even provides a great source of eye vitamins to protect against macular degeneration and cataracts. The best part is that this everyday vitamin is something that’s found abundantly in fruits and veggies like carrots, sweet potato, kale, and spinach – all of which are delicious juicing ingredients! Here are a bunch of juice recipes that are chock full of the acne-fighting, eye-protecting Vitamin A! In the mood for an unconventional juice recipe? Sure, it might taste a little different from what you’re used to, but it also comes with some differently exceptional health benefits. Like those provided by bell peppers – this sweet and juicy veggie is the perfect beauty food since it’s packed with collagen-helping vitamin C and also contains phytochemicals known to stimulate metabolism. Red bell peppers are also high in vitamin A – you know, the antioxidant responsible for promoting eye health. Pumpkins aren’t too shabby in that department, either – your average pumpkin, with its bright orange loveliness, contains 100% of your DV for vitamin A (for 100 grams). Not bad. Not bad at all. Lemons, with their high acidity, help to balance your body’s pH levels and add a welcome zest to this juice recipe. But I have to say…the real star of this recipe is the ginseng root. This potent root is a multi-tasking wonder, improving your immune system, enhancing your mental prowess, slowing the aging process, lowering stress and restoring your body’s homeostasis, and giving your energy levels a huge boost. 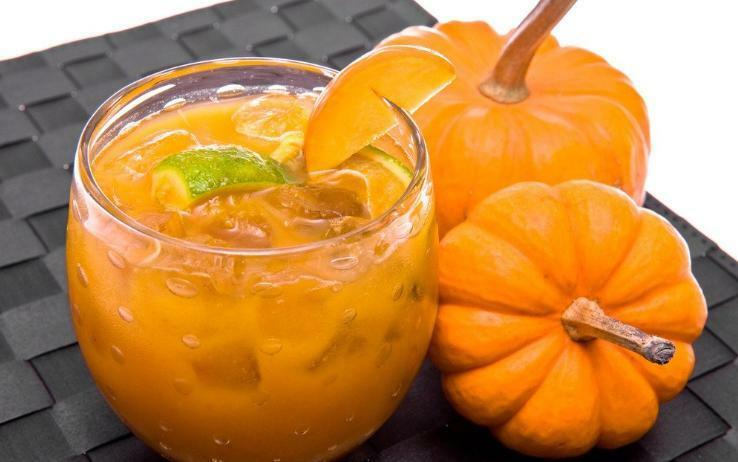 As delish as this juice recipe is, try to refrain from drinking it daily – you might turn orange. Okay, now that that’s out of the way…this bright orange juice recipe is simply awesome and my go-to recipe whenever I know my body can use a potent dose of immunity. It’s chock full of anti-oxidants. 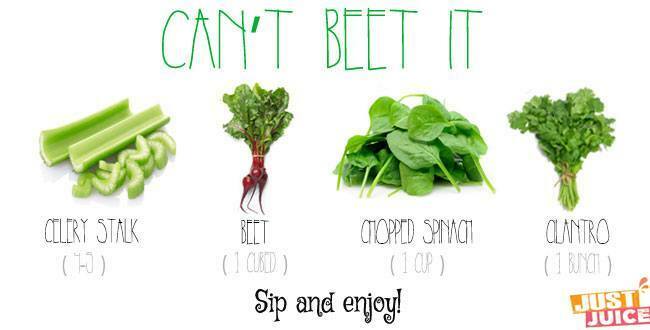 Beets are loaded with the phytochemical, betanin, that helps gently detox while helping to reduce overall inflammation in your body. Carrots are bursting with vitamin A, which keeps your eyes healthy, your skin glowing, and speeds up the metabolism of blood sugar in the body. As for orange, you already know it’s filled with vitamin C – plus, it adds a delicious zesty sweetness to the mix (you can also replace the oranges in this recipe with grapefruit if you’re juicing for weight loss). 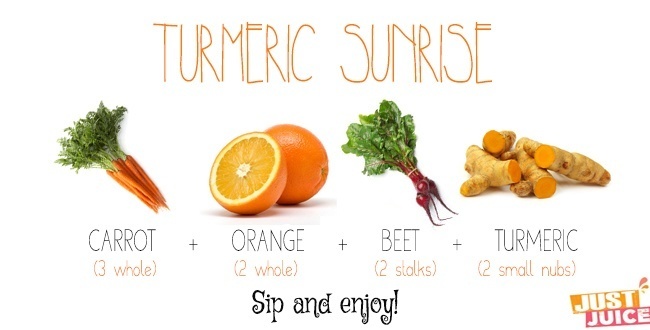 And to top it all off, spicy turmeric adds a potent anti-inflammatory, protective boost to the mix. Oh, did I mention the overall result is pure, orange deliciousness? This 4-ingredient juice is one of the simplest green juice recipes you’ll find – perfect for when you’re in a rush. The celery contained in this juice brings with it a whole lot of antioxidants, and vitamins and minerals in plenty—including some that are less-commonly encountered but are nevertheless essential to your well being ones, like molybdenum and phosphorous. This recipe is also really high in apigenin, that wonderful. flavonoid which help protects from neurological problems, heart conditions, high blood pressure and cancer. Then spinach brings up the vitamin count by a whole lot, adding in chunks of vitamin A, vitamin C, vitamin K and even more minerals. Cilantro brings in beta-carotene, beta-cryptoxanthin, lutein and zeaxanthin, as well as its almost magical hard metal detox properties. If you like the taste of licorice – you’ll love the fennel in this healthy juice recipe. So feel free to add in a little bit more than this recipe calls for. Especially if you’re looking to get your digestive juices and your circulation flowing. You see, fennel’s got both iron and the amino acid, histidine. Both are great if you’re anemic and even if you’re not, both iron and histidine help produce hemoglobin, which transports oxygen within the blood and throughout your body. Fennel’s also great for eye health, containing oils that help rejuvenate tired eyes. 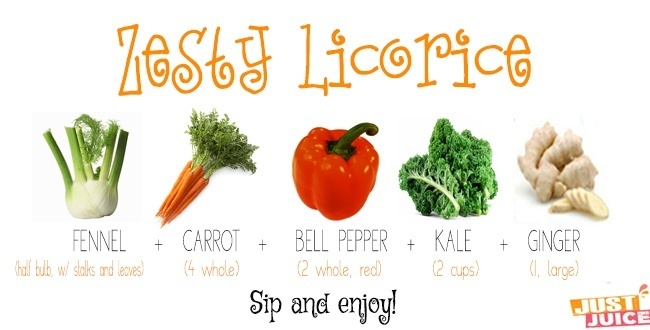 Along with vitamin-A-packed carrots and bell peppers, this is one juice recipe guaranteed to be welcome by both your taste buds and your eyes.